Here is a guide to the different types of sushi that are available in Japan, followed by a sample sushi restaurant menu. 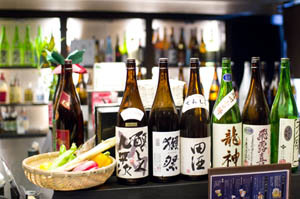 This includes a glossary of fish and seafood items that are commonly used in sushi, a guide to maki-zushi (sushi rolls) and other sushi menu terminology, and a few helpful phrases for ordering in Japanese. Nigiri-zushi is the best-known variety of sushi; it consists of a piece of fish or seafood (or vegetable or even meat) placed on an oblong finger of lightly vinegared rice, often seasoned with a dab of wasabi. Fish is usually raw; shellfish is sometimes cooked. When fish roe or sea urchin is the topping, the whole ensemble is wrapped in dried seaweed (nori) to keep it intact; this is called gunkan-maki (literally "battleship wrap"). Nigiri-zushi is actually a regional specialty of Tokyo, and it's also known as Edomae-zushi, "Edo" being the pre-1868 name for Tokyo. Maki-zushi is made with a bamboo mat, which is used to form strips of tuna, cucumber or other ingredients along with a mass of vinegared rice into long, seaweed-covered rolls. The rolls are then cut into slices. Futo-maki is a variation where the roll is much fatter than usual, and traditionally filled with egg custard, pickled gourd and bits of vegetables. Temaki is similar to maki-zushi, except that it's made by hand and the finished cone-shaped product is eaten by hand, with or without soy sauce. Sashimi is an assortment of sliced raw fish served on a platter with shredded radish and other garnishes. It's often served as an appetizer with drinks. Chirashi consists of sashimi and chopped vegetables arranged over a bowl of rice. 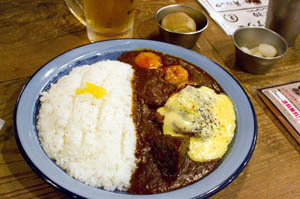 It usually comes as a set meal, in price levels based on size and quality of ingredients. Oshi-zushi is a specialty of Osaka, made by pressing a layer of fish (highly vinegared and sometimes lightly steamed) onto a layer of rice in a large wooden mold. Afterwards, the oshi-zushi is removed from the mold and cut into bite-size rectangular pieces. 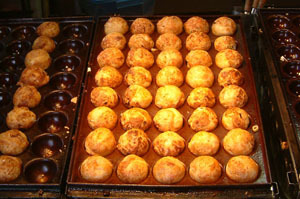 Inari-zushi is rice and chopped vegetables stuffed into a pouch of fried tofu; it can sometimes be found in outdoor food stalls, grocery stores and department stores. 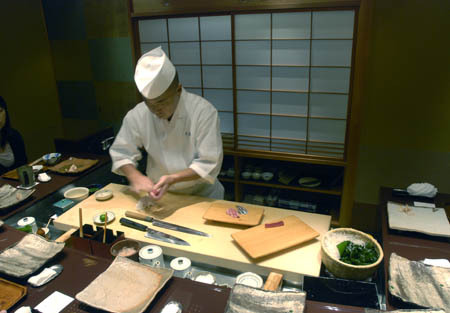 The first three types of sushi can be ordered individually, or in various set meals. Sashimi and chirashi-zushi are generally ready-made assortments (although if you're at the counter you can order most sushi items as sashimi). 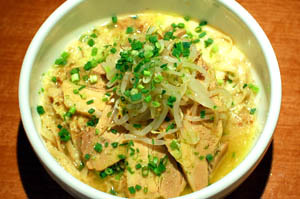 Oshi-zushi is generally found in the Kansai region (Osaka and Kyoto).